Slope-stability or mass-movement problems occur where either sediment and/or rock and/or snow move downslope in response to gravity. Potential slope-stability problems exist wherever development has taken place at the base of steep slopes. An eight tonne block of stone sits on top of a car parked beside a house after falling from the top of a 100 m slope. 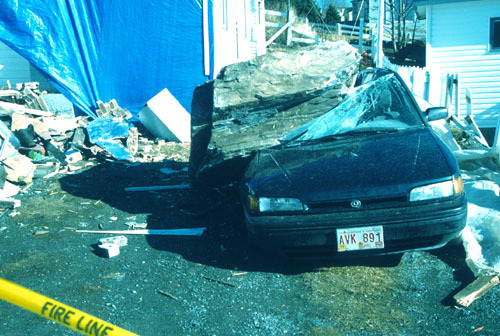 Reproduced by permission of the Government of Newfoundland and Labrador © 1999. 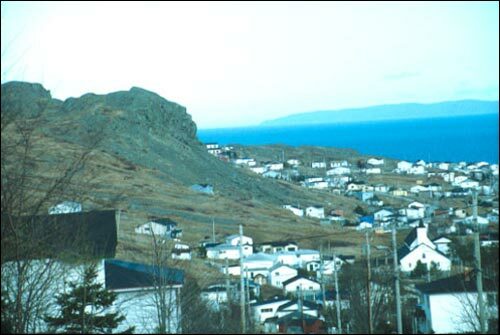 A view of the town of Upper Island Cove looking east into Conception Bay. The 100 m slope from where an eight tonne block toppled can be seen at the left of the picture. The rock came from a wedge type failure, and travelled down a direct path, bouncing and splitting into two fragments at the base of the slope. One fragment came to rest on top of a car. Downslope movement is a natural process, but can be accentuated by undercutting of the base of slopes, clearance of stabilizing vegetation, or diversion of natural drainage. Types of downslope movement include landslide, avalanche, rockfall, rock slip, and rotational slumps. The first three are rapid events, and generally the most dangerous to life and property. Some main types of mass movement. Variations in water content and rates of movement produce a variety of forms. A rockfall is simply a volume of rock made up of individual pieces that fall independently through the air and hit a surface. A debris avalanche is a mass of falling and tumbling rock, debris, and soil. It is differentiated from a slower landslide by the tremendous velocity of onrushing material. The extreme danger of a debris avalanche results from its high speed and consequent lack of warning. A landslide is a sudden rapid movement of a cohesive mass of material (soil, rock, etc) that is not saturated with moisture. It involves a large amount of material failing simultaneously. A common type of slide is the rotational slide or slump which occurs when surface material moves along a concave surface. Frequently water is present along this movement plane and acts as a lubricant. The simplest form of	rotational slump is when a small block of land shifts downward. The upper surface of the slide appears to rotate backward and often remains intact. When the moisture content of moving material is high, the term flow is used. Flows include earthflows and more fluid mudflows. Adapted by Tina Riche, 2000.